Photograph depicts a group of unidentified women at the end of a table set with a white tablecloth and many desserts. The women are at an unknown event in a domestic setting. Photograph depicts four unidentified women sitting in a row on chairs. The women are at an unknown event in a domestic setting. Photograph depicts a group of unidentified women sitting on one side of a table set with dishes on a white table cloth at an unknown event. 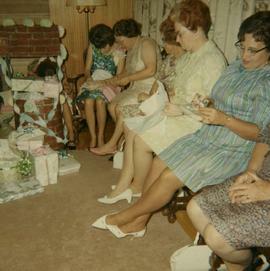 Photograph depicts a group of unidentified women sitting in a row behind a table set with a white tablecloth set with a flower arrangement and candles. The women are at an unknown event. 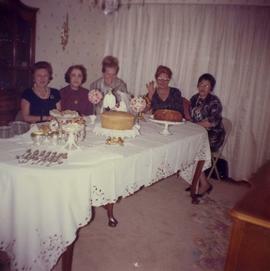 Photograph depicts a group of unidentified women posing at the end of a table with many desserts on it at an unknown event in a domestic setting. B&W print depicts an unknown woman and a small child crouching in a field of grass.Note: colour adjusted on jpg. Photograph depicts an unknown woman at a B'nai B'rith Women Pacific Southwest Region No. 56 convention. B&W print depicts an unknown woman in a flapper style dress posing for the camera.